In addition to trading Vipers (VTI), which can be traded just like individual stocks, we've also used other trading vehicles that more or less track the movement of the NYSE Composite Index. The Schwab Total Stock Market Index Fund (SWTIX) attempts to mirror the broad market movement. If a Schwab customer, you can trade this fund without charge if you hold it for 90 days. The Vanguard Total Stock Market Index Fund (VTSMX) attempts to mirror the performance of the Wilshire 5000 Total Market Index. The Vanguard Institutional Index Fund (VINIX) atempts to mirror the performance of the S&P 500 Index and is offered by a number of 401K plans as an investment option. 1. We enter and exit the market, when the signals tell us to, using an Exchange Traded Fund like the Vanguard Vipers Total Market Trust (VTI) which can be traded intraday, or an index fund like the Vanguard Total Stock Market Investment Fund (VTSMX) which can be traded daily. 2. We have bought and sold individual stocks based on BUY and SELL signals for the market based on the idea that most stocks have a high BETA. That is, their price movement is highly influenced by the movement of the overall market. This has worked well for us except when a stock drops ten to twenty percent in one day. See the "Stocks" tab above for examples of specific stocks we owned during 2002. 3. When the signal indicates SELL, we could take short positions in individual stocks. However, our preference is be in cash while the market is moving down. 4. Equity options can be bought and sold based on the BUY and SELL signals So far we haven't used our system to buy or sell equity options. There are a number of ways we use these BUY and SELL signals which are triggered by movement of the NYSE Composite Index. We act promptly after receiving a signal because that should be close to the pivot point in the change of direction of the market. Each individual investor is responsible for his own investment decisions. Blindly following BUY and SELL signals from any source can result is a loss of part or all of your investment. Anyone using our buy or sell signals does so at their own risk. We make no guarantee concerning the ability of these signals to provide positive earnings from trading in the stock market. We use our proprietary system to generate BUY and SELL signals for our on use and share them with others for educational purposes only. While we have developed a high correlation between these BUY and SELL signals and the historical movement of the NYSE Composite Index, there is no guarantee that the future correlation will be as significant and we make no guarantees or warranties concerning the ability of these signals to predict the future movement of the NYSE Composite Index. Our listing of example funds or indices should not be construed as an endorsement of those particular financial instruments. One thing most market traders agree on is "Don't fight the Market". By that they mean if the market is going up, buy stocks. If the market is going down, sell stocks. There will always be periods when the market will move up sharply for significant periods of time. We want to know when the short term overall movement of the market is going up and when it is going down. That's exactly what our market timing system attempts to do. It doesn't predict the future direction of the marekt, but it does tell us the current direction of the market. You can see how well our system performs since we publish our historical Buy and Sell calls (except for the last two) for all to see. We started issuing BUY and SELL signals during the middle of 2002 and put up this web site in January, 2003. Make your own judgement about the usefulness of the past signals and if you believe you can learn from following these signals, go to the subscription page for more information. 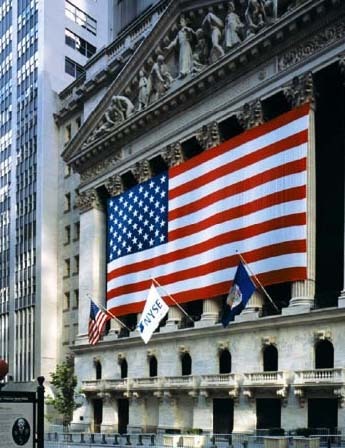 The New York Stock Exchange (NYSE) Composite Index measures all common stocks listed on the New York Stock Exchange. The index tracks the change in aggregate market value of NYSE common stocks, adjusted to eliminate the effects of capitalization changes, new listings and delistings. The market value of each stock is calculated by multiplying its price per share by the number of shares listed.